This post is sponsored by FilterEasy. 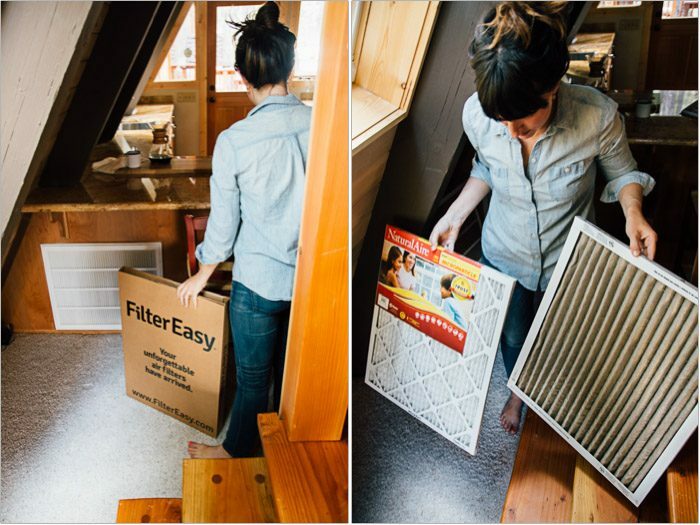 It’s not the most glamorous post topic, but it’s an honest one: Go change your air filter! Last year, when spring began, we had someone come out and test our heating and air-conditioning unit. We had just gone to solar power, and we wanted to make sure our energy usage was as low as possible. One of the first questions he asked me was about our air filters. How often were we changing them? If the airflow is reduced from clogging, it can force your AC and Heating systems to work harder. I realized I wasn’t even sure if I were pointing to the right place. You mean those vents? Is that the air filter? This is one of those things about working from home that no one really talks about: you become the go-to contact for every handy-person, delivery, repair service, etcetera. And, while I’m not proud of this, there are just certain things I don’t pay attention to when it comes to home maintenance. I’m slowly learning—both because I have to, and because it’s embarrassing when someone asks you about your roofing material and you aren’t sure what to say. Frankly, it comes back to arbitrary divisions of labor. For example, Aron is the dog poop guy, the trash guy, the one who renews our diaper subscription. I keep the kids nails’ trim, get the laundry going, and buy the birthday cards. He makes the plumbing appointment; I meet with the plumber. And so on. 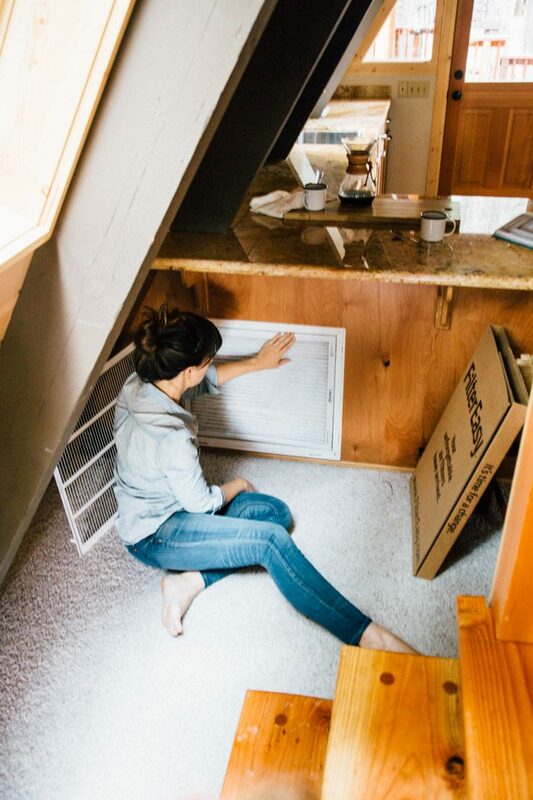 Anyway, it turned out air filters hadn’t made it onto either of our lists, and that they should be changed every one to three months—both to save energy, as we discovered, and to keep the air you breathe cleaner. If you haven’t changed yours in a while, just wait ’til you see your old one. It’s so gross! In fact, as a result, when we started getting settled in the cabin last month, one of the very first things we did was change the air filter. 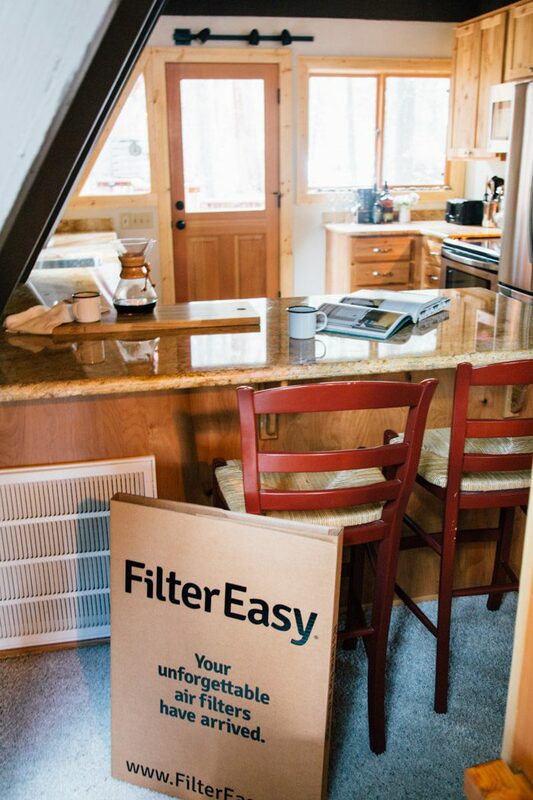 We also were happy that, coincidentally, FilterEasy got in touch to tell us about their filter subscription service, so we won’t forget when it is time to change them again. They deliver your exact number of filters, in exactly the right sizes, only when you are supposed to change them (so you don’t store them and forget about them). When the box shows up at your front door, it’s time to change the filters. Go check your filter—cleaning-wise, it’s immediate gratification, and you’ll help your cooling system to be more efficient for the summer. Giveaway! Visit http://air.filtereasy.com/hitherandthither/ to place an order and the first 150 people who enter their email address will receive their first set of filters of any size for free (plus free shipping)! All entries following the first 150 will get 65% off their first set of filters. Plus, for the next 10 days, all entries on http://air.filtereasy.com/hitherandthither/ will be entered to win a $250 Target gift card! You can modify or cancel your order at any time. This post is sponsored by FilterEasy. Don’t see your size directly on our site? Simply email [email protected] with your size, mention this blog post, and you can still get your first order FREE!